SWIMMING: Despite a predicted 38 degrees, the day was not without a breeze, making it ideal weather and not too hot for the annual Dalby Open Swim Meet. Swimmers from as far as Brisbane and Roma travelled on Sunday to participate in Dalby's largest swim meet to date. 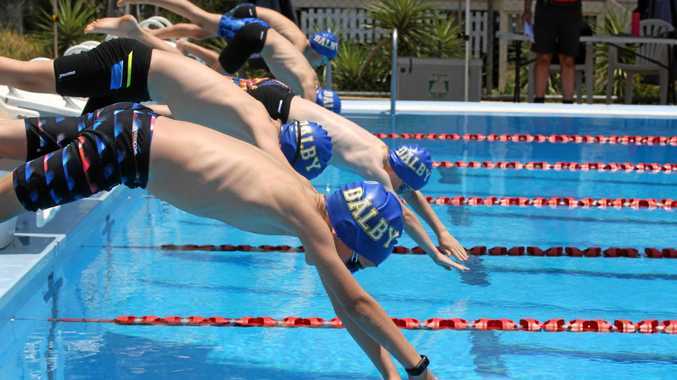 Hosted by the Dalby Dolphins and held at the Dalby Aquatic Centre, the yearly event is no stranger to crowds, but there was a greater rate of participation from Dalby locals than usual. "We get people from all over the area coming to visit,” said head coach of the Dalby Dolphins Brian Shorter. The event drew 100 more participants this year than last, with a record-breaking 60 competitors from Dalby. Shorter said a few swimmers outperformed themselves. A 15-year-old from the Dalby Dolphins, Mitchell Hemmings, broke his own record on the day. Hemmings' previous record for the category was 29 seconds. It's not the first time Mitchell has impressed this year, as he recently qualified for the National 5km Open Water Swim and will be travelling to South Australia in January. Swimmers between the ages of six and 17 took part in the carnival. The age champions from Dalby were Bryce Krause in Boys 8 Years; Alexandra Boland in Girls 9 Years; Mitchell Sterns in Boys 12 Years; Mitchell Hemmings in Boys 15 Years, and Danielle Leggett in Girls 16 Years. Participants came from Dalby, Brisbane, Stanthorpe, Chinchilla, Jandowae, Roma, Kingaroy, Toowoomba and more. Shorter said the day was fantastic and that everyone performed well. "Everyone who came along said what a wonderful carnival it was,” he said.